Few foods shout comfort quite like a creamy risotto. It’s super easy to make and equally easy to bulk out with nutrients by simply adding a few extra veggies. For me, risotto is something I enjoy making for friends, or having as a Friday night treat after a busy week. The addition of crispy sage leaves upgrades this dish to more of a crowd pleaser, adding crunch and extra flavour. Hopefully you won’t be on the “too many carbs” bandwagon but in case it’s a concern, let me reassure you, the evening is actually the best time to eat things like rice & pasta. Carbohydrates are far easier to digest than protein so they allow you to sleep better. Put the cubed butternut squash on roasting tray, scatter over the chopped rosemary, drizzle with rapeseed oil, season with sea salt and black pepper and add the unpeeled garlic cloves. Roast in the oven for 30-40 minutes until soft. Pay attention that the garlic doesn’t burn, removing it from the roasting pan a few minutes earlier if required. Whilst the squash is roasting, make the risotto. Put a pan on a medium heat, melt the butter and add the onion. Cook with a lid on for 5-10 minutes until the onion softens. Season with a generous pinch of sea salt and black pepper, turn the heat up to medium high and stir in the rice. Cook for a minute, stirring to prevent the rice from sticking. Add a good splash of stock and the bay leaf and reduce the heat to low. Keep adding stock little by little until the rice is fully cooked (taste it to test it). Add a little bit more salt and pepper if required. Remove the butternut squash from the oven and mash half of it with a fork. Stir into the risotto. Squeeze the garlic from the skin and roughly chop if not separated. Stir this into the risotto too. Take the risotto off the heat and stir through the goat’s cheese. To make the crispy sage, put a piece of kitchen towel on a plate and heat the coconut oil in a frying pan on a medium high heat. Drop in the sage leaves and allow to cook for a minute or too until the leaves stiffen up. Take them out immediately and drain on the kitchen towel. The sage leaves should remain green but be crispy. 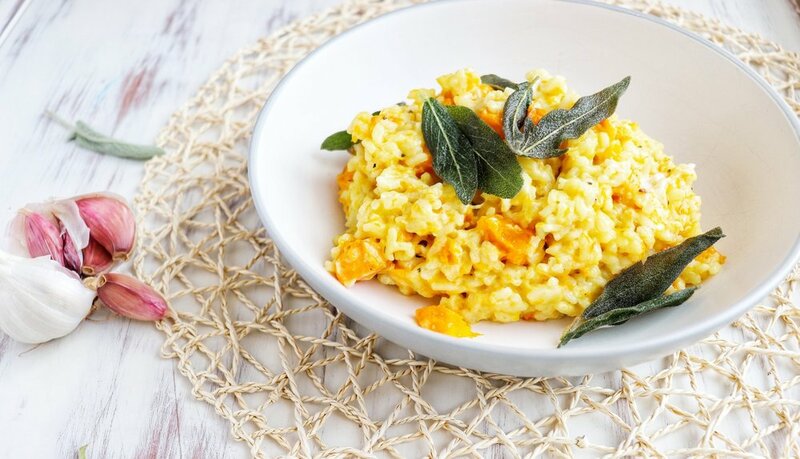 Divide the risotto between two bowls and scatter over the crispy sage leaves.